I am trying to determine at what line length that I will be propagating an AC wave instead of just and RC limited signal. To that end I need to be understand the slew wave form generated by the time it takes for the pin to reach 3.3v. I've read many posts about slew rate here and I've examined the documentation, but I have not seen a measurement in v/ns. Does anyone have this measurement, please? The difference will tell me specifically when to use C & R termination instead of simple impedance matching. For general connecting of Prop pins to other devices on the same board no termination is needed. On the other hand, if you are pushing the signal from a Prop pin over a long cable, then perhaps that is not the thing to do. Rather have a line driver of some sort. I'd make a quick and dirty measurement with my 100MHz scope but darned if I can find a Propeller board here just now. I suspect that the slew rate is fast enough that this scope won't really tell much though. My Tek TDS 360 (200Mhz - 1Gs/s) doesn't fair much better. Measuring a dangling pin of a DIP40 prop with a Tek P6106a 10x probe (10Mohm; 11.2pF) and 16 sample averaging. One of which is the potential of a direct driven differential communication over ribbon cable to decrease cross-talk and increase the potential cable length for wide parallel communications, on the same board or otherwise. Assuming a propagation speed of 1.5X10^8, and a transition speed of 67ns (fastest I've been able to achieve between triggers, measured by read operation) then I should be able to use a cable up to 500 cm for single sided comms. When I examine that cable length and assume Martin Hodge's measurement (Thank you for taking the time to do that) then I have a reflection wave in the 397MHz range that I have to deal with. Anything within range of a 500CM cable will most definitely be propagating an AC wave. In this case I will be sure to pass multiple grounds and use caps and resistors to terminate the same wave. This over basic impedance matching. I have no intention to use a 500cm cable but I don't necessarily want to be restricted to RC signal length in my designs. I also plan on using the prop 1 in desktop clock and I will have loads of EMI to deal with. Knowing that I may have a stray 397MHz oscillation to deal with will be very helpful as well. My DE-5000 will help, but I not without the proper math and I don't have a good o-scope yet. I think you worry too much, mikeologist. Given that you are bit banging the IO pin(s) and the Prop is executing PASM at 20M instructions per second, then your maximum bit toggle rate is 20MHz. Or 50ns between edges. I would not worry about the odd nano second here or there in rise/fall time. I might worry about the capability of the pin to drive a 5 meter length of cable. Given the impedance of the cable. At this point I have no idea. Never tried it. My understanding of all this is that when cables are long one needs to terminate the connection with an impedance that matches that of the cable. To prevent reflections. Of course the source should also match that impedance. Impedance matching fails above 8" wires for my parallel comms. Cross-chatter becomes an issue, but adding a 470 cap and a matched resistor (100 in this case) on the data lines straightens the issue right out. The only way I can see this being a solution is if I'm propagating an AC wave and I'm experiencing oscillation between devices. I'd really like to understand the math and the science behind the solutions as I've found them. If I blindly apply the work of others without understanding it I fully expect that I will make major mistakes and miss many opportunities for design optimization. This math will also help me in prototyping boards and combining other MPUs and/or other ICs with the propeller. Thank you for taking the time. I appreciate the help. That is perhaps a different issue. If you are getting cross-talk between channels of a parallel link. I'm no expert but decades ago I was called in to diagnose a multi-processor system that was proving unreliable. It had an address/data bus running across the back of a 19 inch rack of cards. All good old fashioned wire-wrap construction. I put a scope on those data lines and all I could see was noise. I wondered how it worked at all! So I ripped out the point to point wire-wrap connections and rebuilt the bus using a twisted pair for each signal line. All signals were then nice and clean. Worked a treat. In that case impedance matching was not the issue. Cross-talk was. I'm surprised you are having these issues over only 8 inches. How is this physically constructed? What exactly are the loads you are driving, and what is good/bad results? Usually it is clock lines that are the most sensitive, in data transfer errors, but there are many other effects to watch out for. I’ve seen LED drivers that quite deliberately skew/delay switching so that all nodes do not try to change at the same time. This lowers ground bounce, by spreading each into its own time slot. I should have specified better, my next step up from 8" is 14". 8" works fine. it's the 14" line that's the issue. As for the construction it's still a bit loose. I will rebuild it a bit better before I bother seeking specific help here, but it does work with the C & R termination. The clock line was an issue at first, I move it to the outside of the ribbon and put a ground between it and the rest of the ribbon. I used delays to stagger 4 cogs by 10ns each and had them each read the data(outbound) immediately after it's written, and within the window of the square-wave high position. Often there are signals recorded on pins that are supposed to be low. Further investigation led to the correlation that this only occurred on low pins adjacent to high pins. Additionally the ghost signal flip-flops between each of the monitoring cogs. Based on this and all the reading I've been doing I concluded as best I could that I was dealing with some sort of wave-like interference caused by unexpected oscillation on active data lines that are supposed to be square-wave high at the time. All this is an amateur opinion at best though. I would expect any parallel bus a Propeller can bit-bang to be able to traverse 14 or more inches of ribbon cable without any issues. OK, perhaps make every other core in the ribbon a ground. Like those old IDE cables on PC disk drives. These kind of problems are fun. They remind us that digital logic circuits are neither digital nor logical. Rather they are a big wobbly jelly of inductors, capacitors, resonant circuits and antennas all coupled by electromagnetic fields where disturbing any part can have an effect in every other part. Until 2006, approximately, I've used to have some partially used rolls of these. I can't remember where I've left the last ones, so many times I've moved, since then. The ones we've used, were specified for 100 Ohm impedance, approximately. The flat crimpable surfaces were a foot apart of each other, IIRC. The light brown conductors were grounded, only at signal's reception-boards side, to avoid ground loops. The signal drivers were of the open-drain uncommitted emitter-follower type output ones, the terminating resistors were in the range from 92 to 108 Ohm. Good cables, and sure, old good times too. Nowadays, you have access to these ones, for a finer pitch connector. The impedance seems to be the same, by the spec sheet. Perhaps you'll find MAX22500E a suitable transceiver for comms applications, involving long cable runs. Spec'ed for both 52 and 100 Ohm cables. P.S. A good TI document, focused on differential cable termination techniques. A lot to learn about that subject. +1 solid tip on the grounds. I read that somewhere else too and hadn't given it enough thought. I'm going to try different configurations as well. If ground adjacency is the fix from that adjustment then I'm going to try every other one as well as every third one as it still provides one adjacent ground for every wire. Anything more than the single one I'm using currently has to be better. I am enjoying myself. There's so much to learn. @Yanomani Thank you for the document and the cool cable info. Currently I am using flat ribbon cables. I do have a couple kilometers of CAT-6 & CAT-5, both plenum and riser. I could cannibalize it as needed to make my own twisted pair ribbon cable. Thoughts? 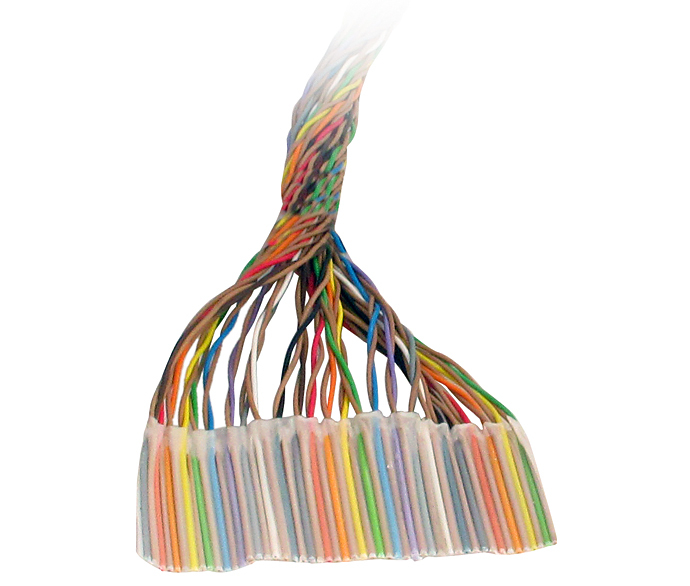 As for theese cables, I believe they'll satisfy any needs you'll about to face, but you may need to carefully choose the crimpable connection method, since they are based on solid copper wire conductors. I've no experience at all in such use of any IDC connectors, for example, but I'm also not an expert in this subject. I've found another very good reference, from B+B SmartWorx. Surely it worths the reading. "A good rule of thumb is if the propagation delay of the data line is much less than one bit width, termination is not needed. This rule makes the assumption that reflections will damp out in several trips up and down the data line." Which suggests that Mikeologist need not worry about termination. An oft' used approach is to use IDE cables. They are plentiful and cheap. IMHO, i'll not feel that confortable, being at the passenger's seat of any car, in situations where I don't trust the driver skills or if we are to travel at some unknown lane. For single signal lines (half duplex communications) up to four (full duplex communications, two handshaking lines) at some low speed serial link, I'll agree to rely in simple termination schemes, up to none at all, if the channel's topology has no support for any sharing. But, for bussed data lanes, possibly with some direction control and even clocking, it doesn't appear to be a sound practice. The greater the number of lines you put in close proximity, the worse the slight differences in their slew rates and travel times will play havoc at receiver's endpoint, to say a minimum. Parallelizing them, into an unterminated flat ribbon, would be like spilling cold water drops, into an olive-oil filled, hot frying pan.. Think in many rattle drums, being randomly played by a bunch of drunk carnival party dancers, and you'll visualize what I'm trying to say. The later day IDE (ATA) cables have a ground conductor between every data conductor so as to reduces cross-talk, improves signal integrity. That may not be as good as a twisted pair per signal but clearly it works very well. The data rates on those ATA busses are much higher than one is going to achieve using Propeller pins so I'm pretty sure ATA cables will do. Perhaps some termination is called for but I doubt it for such distances and data rates. If it were me I would try it. Pump some data down the bus and look at what arrives at the other end with a scope. That sounds like a great plan. I'll give it a shot and post my results. Thanks everyone. There's lots to work on now. I have found that stuffing edges down wires needs "the perfect world" - send it at the right characteristic impedance, and terminate it with it too. That will always mean that the best voltage extracted from the other end will be 50% at best - and that assumes that the source (propeller's output impedance (27 Ohms (@ DC)?) + series resistor +++) can handle it. The far end termination would correctly load the transmission line, for under/over shoots - reflections, but also help by not allowing the receiver to still present a high impedance - prone to all sorts of pick ups induced from near-field lines. I think you are right. In that perfect world the source impedance matches the transmission lines characteristic impedance which matches the input impedance at the receiving end. That way your signal arrives intact and there are no horrible reflections to worry about. But wait, as you say, the signal level at the far end is only 50% of what the transmitter is putting out. That means it may not meet the logic level requirements of the receiver. Not so perfect anymore. I suspect that for the short distances that a logic signal is expected to travel that is not the the thing to do. Reflections are not an issue. There you want low output impedance and high input impedance. And hence can have a large fan out. I guess this is why we have dedicated transceiver chips and bus drivers for such like. I wish I could find the SPICE simulation of a transmission line I made years ago. You know, a lot of series inductors with capacitors in parallel. It was a nice demonstration of what goes on in a transmission line. Unrealistically perfect of course. I suppose that if the source is required to be received in many places at full level then a good old fashioned distribution amplifier (or multiple single drivers) is/are required - not just "0 Ohms-3.3V down un-shielded/non-descript wiring going past that Tesla Coil farm ..."
I was shocked to find how expensive cables can be now a days. A supplier of some equipment that we use, that communicates over RS 485, specifies a couple of suitable cables that should be used. 4 core, twisted pairs and shielded, two data and two power conductors. UV resistant. I forget the price of that cable but it was astronomical. As a result management twisted my arm into implementing a wireless solution. Which of course comes with it's own problems and expensive solutions. Now that the whole show is pretty unreliable, it's all my fault! The last time I purchased CAT-6 plenum for a client it was over $350 for 1000 feet. The first time I purchased CAT-5 plenum for a clients it was less than $100 for the same 1000 feet. I'd love to have gone wireless for them but banks insist on everything being hardwired, understandably. They were going to use bits of CATx to do RS422 control interconnects between disk recorders and their archive stores - I used the "doubt" card to cause then to veer away from doing so and buy the right stuff. While you are here though, can you explain your doubt (as mentioned above) so I can read about the supporting ideas, please? Don't worry Toby. The "full problem" here is fuzzy to me as well. I don't think important details like distances and data rates have been specified yet. Also, in my experience so far all that theorizing about transmission lines and impedance matching etc, etc, is all well and good. Until you come to do it in practice. Then things fall apart for all kind of inexplicable reasons that takes an age to diagnose and fix. A while back I was called in to fix a problem with a good old Intel 8255 parallel interface. Nice shielded cables, good grounding, opto-isolators and all. Nice clean signals observed everywhere. Until a nearby bench power supply was turned on. At which time the interface would fail. Turned out the 8255 I/O chip was switching from some pins from output to input at that point. Go in there and configure it back to output and all was well again. I suspect some inductive pulse what getting in there and resetting the 8255 or something like. Even with all the equipment powered from batteries. Gave up chasing that one. It was one of those rare faults that only ever happened in that lab, never in the field. I'd like to fix the rest myself, through research. Years ago I worked in a TV studio. They had 48 SVHS players queued on their own internal timers running on a common external clock. This setup provided 7 days of continuous, unattended programming. The players kept missing their sequences, yielding dead air. A bunch of high-dollar technical consultants said they needed much higher end players to sequence 48 of them as well as a controlling computer. They said to do any less would result in an unstable system. As a CGI tech I spent a lot more time in the studio than the consultants. After spending a week manually activating programs during the day I figured out that the players lost their programming when the lights were on in their closet. So I did some reading and figured out that the strobe characteristic of the fluorescent light was being interpreted as remote control input. It was pretty easy to prove by correlation after reading about it. I showed the manager and he talked to the consultants about it. They again said we need to buy better players that aren't susceptible to the interference. Changing the lights out for incandescent was impractical as we'd have to do it everywhere because of the closet's location. While they were figuring out the best way to waste $100,000 I put gaffer's tape over the ir sensors on the players and programmed the units from the front panel. I didn't really fix the problem, but I did stop the symptom. They kept those players with the same tape on them for 10 more years until they went all digital. Great stuff, thank you. I have to do more reading to completely understand, but you've provided me with enough to find the right reading to do so.